WHAT SORT of loopy person leaves a birdbath tilted for over a decade when it requires only a few seconds to set it straight? That person, of course, is me. But today I spent the few seconds and made it level. The birds had never seemed to mind or even notice. I long noticed but did nothing. The birdbath is a clay bowl that sits atop a carved wooden pedestal, knee-high. The pedestal is rotting, but that’s not what made the whole shebang off-kilter. It’s sat crooked since it was new. I took the bowl off this morning, and moved the pedestal from where it’s rested so long. There was grime below, some bugs and a worm that looked perfect for fishing. I swept it all away with a broom, into the grass. A slight shift to the right and a bit of circular movement set it straight. I put the bowl back on top and it was level, the first time in a long time. The birds still will not care, so this is a strictly human issue. It’s not like the birds need my water supply right now because it rains every day. Pools and puddles are all over the place. No matter. My birdbath is quite popular, but it will become more popular when the rainy season ends next month and a pool will be darned difficult to find. Summer has ended, of course. Our high mountain world is wet, and the plants are happy. 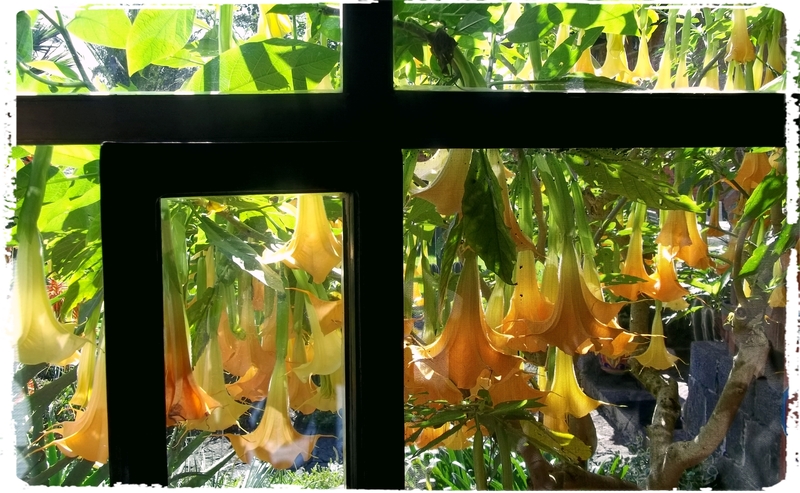 When we open the bedroom curtain in the morning, this is what we see, the photo above, golden datura in a frenzy of flowers. The big aloe vera bushes are full of orange stalks. The birds of paradise have come out to play, the plants, not actual birds, which are not mountain fowl. We must make do with the flowers. I was sitting on the front terraza a spell this morning, admiring it all and thinking what a lucky fellow I am. But I should have straightened that birdbath a long time ago. A personality flaw. I would say the person that doesn’t see the beauty in the tilted birdbath but only sees that it is off kilter is the one flawed…not you living with it quite contently. Bev: I had not looked at the situation quite that way, until now. Perhaps it was an objet d’art before, and now it’s just another birdbath. Actually, I would have done nothing had I not noticed a growing spot of rot that I had not noticed before. It’s old wood. I feared that if I did not turn it around so that the splashed water would fall elsewhere that I would find myself, more sooner than later, having to head up the highway to buy another pedestal. Perhaps the entire situation was inspired more by laziness and cheapness than it was a wish to see the birdbath level. You never know. Señor Zapata, Hola de Bend, Ore. (only for five months. The rest in Mexico, Zihuatanejo to be exact) and a month on the road. Normally, I enjoy your posts if only to disagree, but this one hit home. We have a home on the beach in Half Moon Bay, Calif., and for 2 years I looked at our birdbath in the back yard, catawampus, wash it out, worms and all. Now it’s a rental, so I had to fix it three years ago. It’s concrete, so no wood stand. Our pajaro de paradise is huge. We just can’t stand summers on the Northern California coast, ergo Bend, Ore.
Catinero: I just found your comment languishing in the spam pile. God knows why it landed there. Apologies for the delay. You have raised my vocabulary. I had to look up the word catawampus. Thanks. And feel free to comment again. It likely will not be seen as spam in the future. Life can be tough sometimes for the perfeccionistas among us. Gardening offers its own rewards with the beauty of the flora and fauna, provides healthy exercise and is soothing to the spirits. Andrés: How right you are, and not for the first time. My yard will hit a new level of attractiveness just this morning because the guy down the street is coming to mow it. I have the issue in retirement, that I will have time to do it tomorrow and when tomorrow comes it can wait until the next day. Many of my friends express the same. Maybe you are one of us ! In either case, you got it done today. Mike M: Since you bring up the matter of retirement (such a dreadful word because it conjures up images of smelly old men sitting on park benches), I will say this: I love it. And I knew I would love it which is why I did it at the very earliest opportunity, age 55. It was a very wise decision. Of course, one must be financially able to do it at that point. I was in pretty good shape, though hardly rich and I would not have been able to make it had I remained in the United States. Living in Mexico is significantly cheaper even though you read more and more that it’s not really so cheap anymore. I think people who write and/or believe that have been hanging out in San Miguel de Allende too much. As for the personality trait of doing things mañana instead of today, I am not like that. I generally prefer to do things yesterday, not today or mañana. People are different. So I am not one of you in that respect. I am also extremely well organized, which is to a great degree, I believe, why I was able to retire at 55 while most others drudge on. Congenital thriftiness helps a lot too. I also love retirement and was able to do it at 60, following the same principles (thrifty & organized) as you. Me being organized means my list of things to do today may be so long, I need to put off until tomorrow. Of course today may be interrupted by football, reading, siesta, etc. There are priorities in retired life. Mike M: I always favor siestas. We also retired a few years earlier than most too, and I think that is because we are perfectly comfortable living frugally. I learned how to live well on a little money when we were young and can’t seem to break the habit. If we needed a whole lot of money to be comfortable, then we would still be slaving away in Obama/Ebola land. Oh yes, Cantinflas is playing here, too. How was it? Bonnie: I’m pretty frugal (some might call it cheap) myself, but if I had been otherwise, I would have been a wage slave far longer. Cantiflas was pretty good. We went totally because my wife wanted to see it. I’m not a Catinflas fan and never have been. I’d give it a good 6 out of 10. It won’t win an Oscar.